Earned the first LEED™ for New Construction Platinum rating in Texas. 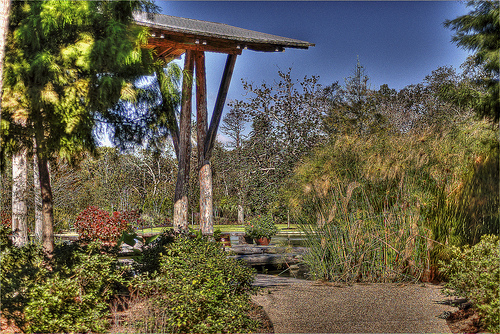 Located on 252 acres in the heart of Orange, Texas, Shangri La Botanical Gardens and Nature Center serves primarily as an interpretive center for the site's native ecosystems—cypress and tupelo swamp, wooded uplands, and prairie lowlands—as well as a facility for study and research. The nature center provides hands-on learning opportunities by means of an exhibit called the Nature Discovery Lab, a laboratory, and three outdoor classrooms located deep in the cypress swamp. 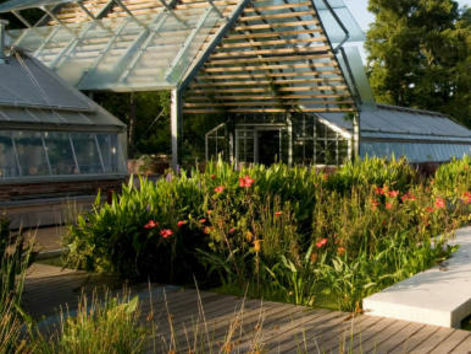 The Orientation Center includes an exhibit hall, theater, interactive children's garden, classroom and exhibition greenhouses, and a water demonstration garden that shows how plants filter pollution from water. A café, garden store, volunteer center, and administrative spaces are also included. This project was chosen as an AIA Committee on the Environment Top Ten Green Project for 2009. It was submitted by Lake|Flato Architects in San Antonio, Texas. Lake|Flato has blurred the line of indoor and outdoor. There’s a lot of shaded walkways so that you go from fully outdoors to shaded outdoors to partially enclosed indoors to fully enclosed indoors. By taking this strategy they were able to get these buildings to operate without air conditioning in Texas. What really charmed me is that this building connects people and users to both the natural and the cultural history of the place in a very profound way, so that so that it combines indigenous methods of building with more advanced sustainable design features that really push the envelope in terms of energy efficiency and water use reduction.